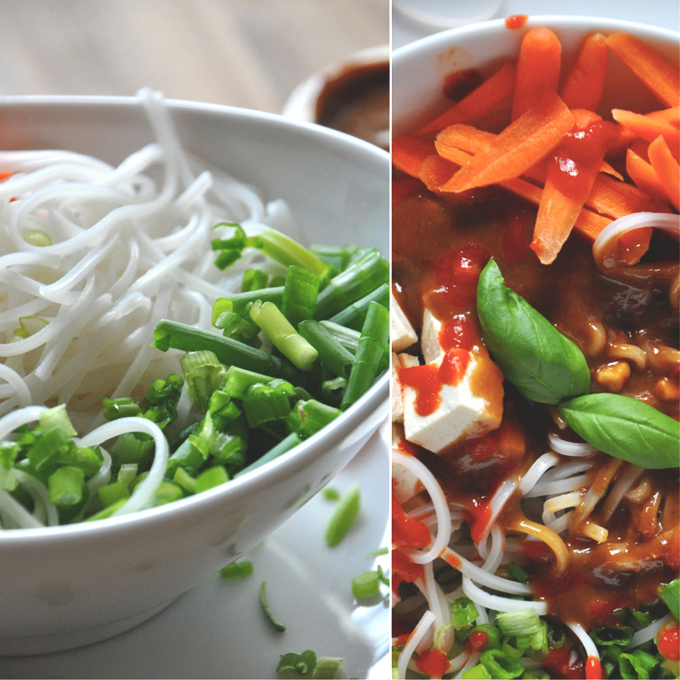 I kind of have a thing for noodle bowls, especially this one since it satisfies virtually all the requirements I look for in a meal: Quick, easy, flavorful, healthy and satisfying. Plus, this dish provides both heat from sriracha and fresh green onion and sweet from a creamy ginger peanut sauce. Friends, this is delicious simplicity at its finest. 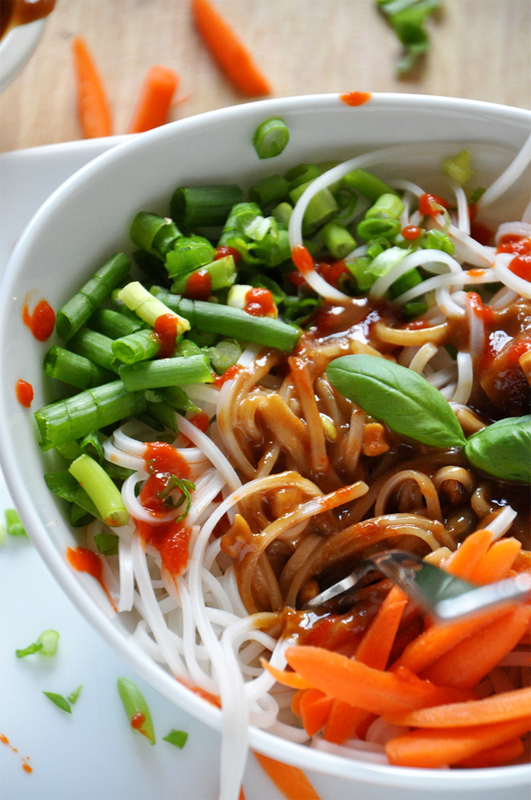 The concept is simple: Prepare rice noodles, chop up fresh veggies of your choice (I prefer carrots and green onions), add in some protein (like tofu), fresh herbs (basil is my jam) and whisk up a quick dressing and throw it all together. It’s so incredibly filling and requires just 10-15 minutes of your time. It’s also vegan and gluten free, and for our peanut butter-adverse friends, simply sub in cashew butter or tahini. Finally, something we can ALL enjoy totally guilt free. I typically make this style of dish for dinner, but add a sauce to the noodles and do a pad thai spin-off. But this fresh version is so light and refreshing and definitely hits the spot mid-day. However, it would make an excellent mid-week meal since it requires little time and thought and can be assembled buffet style so even picky eaters get what they want. The peanut dressing is what makes this dish: Peanut butter, toasted sesame oil, honey, soy sauce, lime, ginger, chili garlic sauce and hot water. 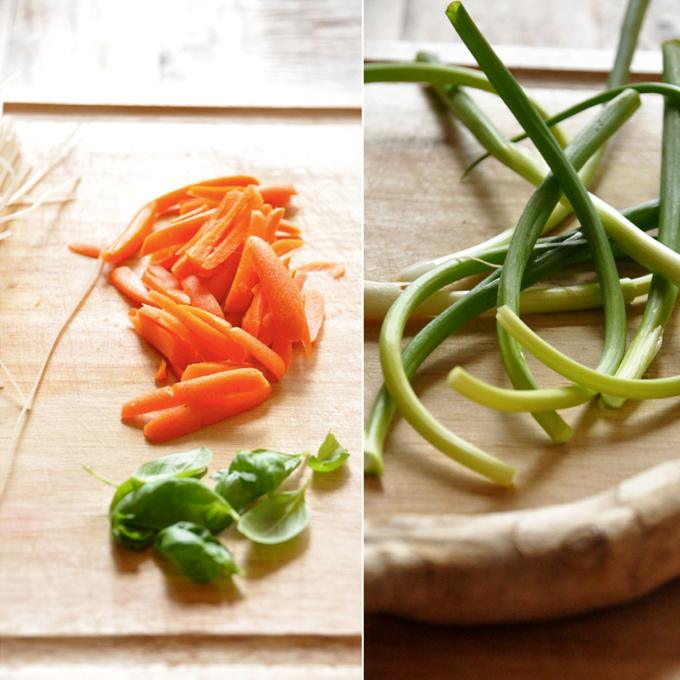 These ingredients can be found at any Asian market and for super cheap. At the market right up the way from our house I score giant bottles of Sriracha for like $2, packs of noodles for $1 and huge bags of basil for 69 cents. SIXTY NINE CENTS! Healthy and cheap? Sign me up. A 15-minute meal that requires virtually no cooking and only one bowl. 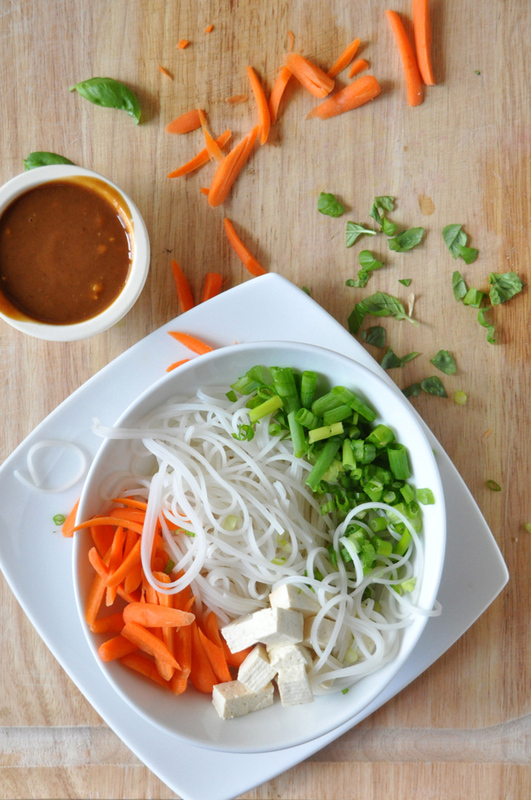 Simply prepare rice noodles, chop fresh veggies, whip up a quick ginger peanut dressing and throw it all together with tofu and fresh basil. A vegan and gluten free dish that’s completely satisfying. Prepare noodles according to package instructions – typically place in a bowl, pour boiling water over and let set for 10 minutes before draining. Prepare dressing by whisking together peanut butter, brown sugar, lime juice, ginger, soy sauce, chili garlic sauce, and sesame oil. If too thick, add a splash of hot water and whisk once more. Set aside. Once noodles are cooked, drain and rinse with cold water. Place on towel to dry slightly. 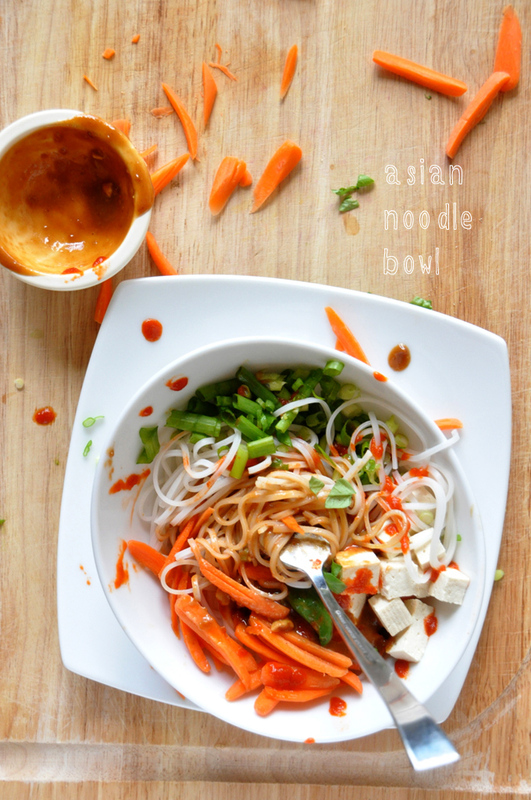 Add noodles, carrots, green onion, and tofu to serving bowl. 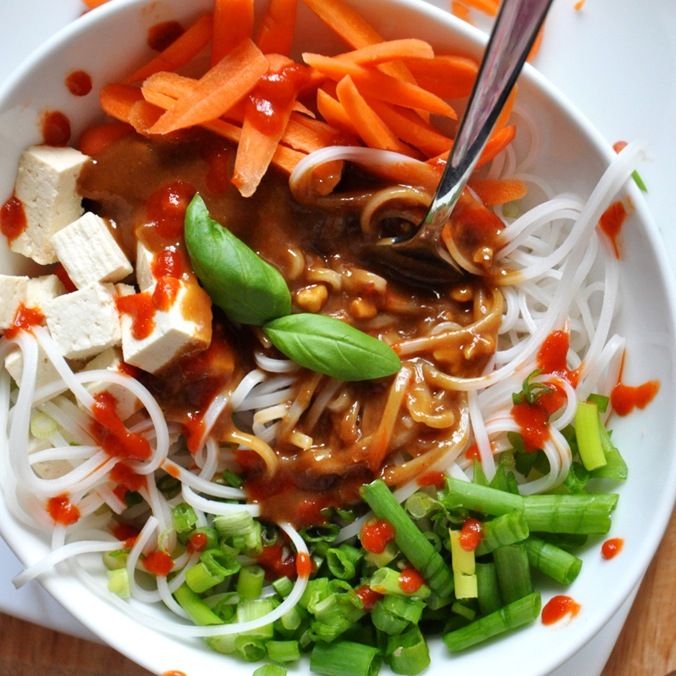 Top with peanut dressing, fresh basil ,and sriracha and serve immediately. Omg!!!!!! This is absolutely amazing!!!!! I am in love with this bowl, I get all my recipeis from this site and everyone so far has been great!! There are definitely a lot of particulars like that to take into consideration. That may be a great point to carry up. I supply the thoughts above as basic inspiration but clearly there are questions just like the one you carry up where a very powerful thing can be working in trustworthy good faith. I don?t know if greatest practices have emerged around issues like that, but I am sure that your job is clearly identified as a fair game. Both boys and girls feel the impact of just a moment’s pleasure, for the remainder of their lives. My wife and I love this recipe and I make it for us a lot. The only thing that I do differently is that I use liquid aminos instead of soy sauce. But this recipe is so easy and amazing. Thank you! I probably make this at least 3 times a month for dinner. I do have to remember that the above is for a single serving. Made a mistake with that once when serving 4. I also like to add the sauce to the noodles and mix, and then I add the veggies. That does a better job of insuring every bite has some of that fabulous peanut sauce. This is really good. Second time I made this I added sliced bell peppers. Thanks for sharing your delicious recipes! I’ve made this bowl several now and everyone asks for the recipe, it is truly a tasty bowl of goodness. Thank you. Is there anything I can substitute for sesame oil? Or will it be fine to omit it altogether? Hi Hannah! You could try peanut oil! This was even yummier them I hoped it would be! This is one of my favorite recipes because it is so delicious yet so fast to make! 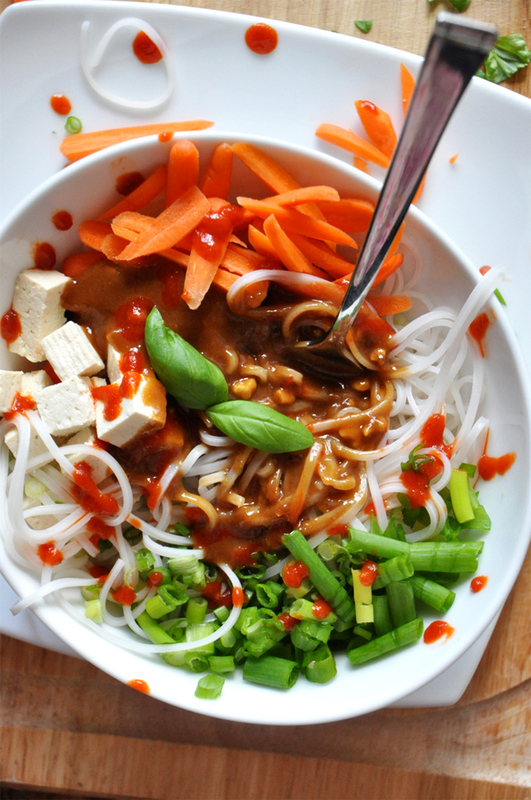 The peanut sauce makes the bowl absolutely irresistible. I will definitely be bookmarking this one! Just made this for dinner tonight…so delicious! Looking forward to trying more of your recipes. I love the simplicity and healthy ingredients. Thank you!! I made this last night for a group of friends (with a substitute on the noodles and tofu for soba and chicken just for personal preferences) and it was really good! The sauce was delicious. Would definitely make again. I’ll have to try it with rice noodles next time since I’ve never had them before! Yummy. Used soy noodles. This is my new favorite website! Made this for dinner tonight with the addition of lightly cooked pea pods (microwaved raw pods for 1.5 min). I was shocked that everyone at the table finished their bowls: even my two veggie-shy teenagers! When I make this again (it was requested!) I will make more peanut sauce and may also add a fresh jalapeno on the side and/or some chopped peanuts. Yay!! What a great report. Thank for sharing, Kat! This looks delicious, I love peanut-flavored sauces but I’m not a big fan of tofu. Would there be a way to adapt this recipe using chicken or ground turkey? West Soy makes an 18 oz package of chicken style seiten (on sale right now for $3.99), that’s what I am going to use here very shortly. Just subbed rice vinegar for the hot water — gives the sauce a nice tang! Nice! Thanks for the tip, Kristine! Probably the most delicious (and simple!) thing I’ve ever made. Thank you! Yay! So glad you enjoyed it, Chelsea. Sorry for the confusion Tim. I usually add honey (if not vegan) in the notes but forgot to do that for some reason. It’s been amended! Thanks for pointing that out. I look forward to cooking this soon. It looks good and delicious! Just ate this asian bowl for dinner tonight and it was absolutely delicious! I decided to cook the tofu and the vegetables quickly. I am drooling. Definitely making this, thanks for posting! Amy, good question. There is gluten in some soy sauces but gluten-free versions do exist. I’m not gluten free myself so it’s not always on my radar but thanks for bringing that up! Yum this sounds so good! My boyfriend and I are traveling around Asia for a year (just spent the last 8 weeks in China) so noodle bowls is all we eat! None of them have peanut sauces though – definitely could use some of that!! This soup looks so delicious! Lovely colors! 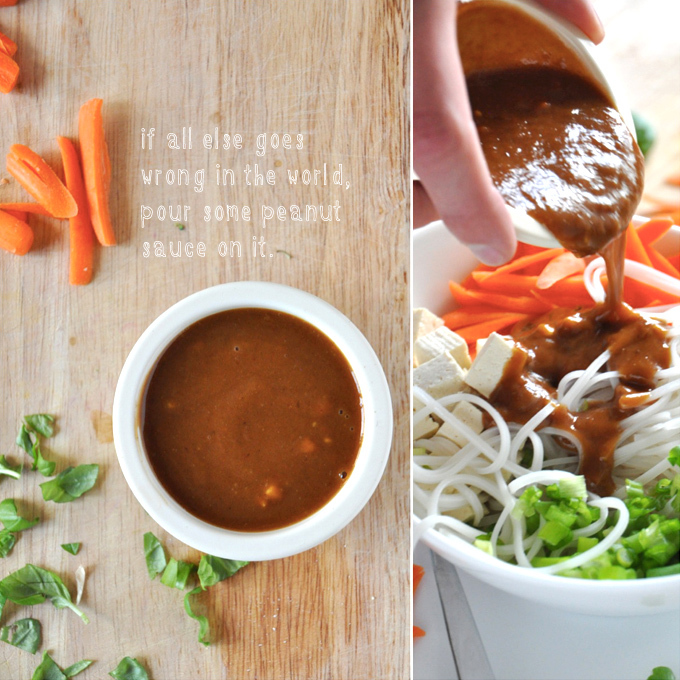 How about “divine!” How about both…we have a peanut sauce recipe from Parenting magazine, but I am looking forward to trying yours…a little more heat will be fun! This looks devine! Can’t wait to try it! Made this for dinner tonight, used edamame instead of tofu and broccoli, pea pods and carrots that were in the fridge. I came home from work hungry and this was perfect it, quick easy, adaptable and the presentation even brought a smile to my face as i sat down with a glass of white wine and my bowl. It has now been added to my list of quick, yummy meals. Thanks! Lovely to hear, thanks Sherry! Wow, that bowl sounds and looks quite delicious. I love how the presentation is that good kind of messy. Makes me want to dig right in!